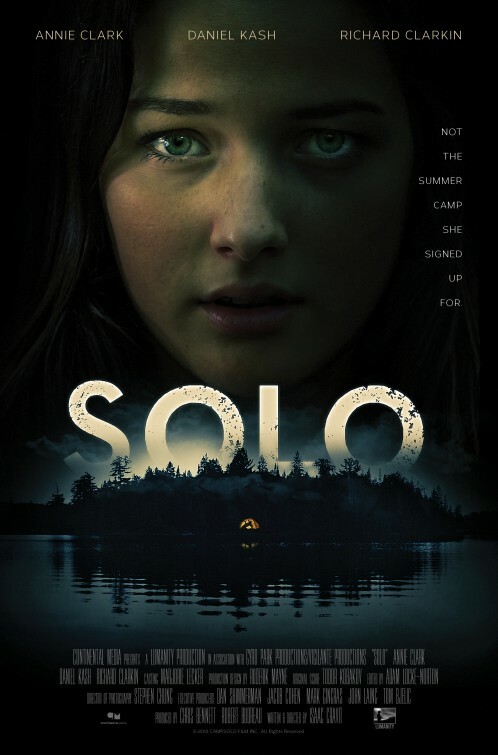 Solo starts out on an “A” game, but ends up finishing with a generous “C” grade. Isaac Cravit’s independent thriller is a straight-up campfire story – and, the filmmaker knows it. Gillian (played by former Degrassi: The Next Generation co-star Annie Clark) needs to prove herself to be a capable camp counsellor in order to obtain a summer job. The newbie needs to pull a “solo”, a two-night experience on a secluded island that will test her survival skills. Cravit, directing and writing his first feature film, is having a lot of fun playing with the conventions of a campfire horror. The filmmaker even has fellow councillors telling Gillian rumours of haunted activity that took place on the island before she embarks on her trip. These moments don’t feel like Cravit is pushing too hard for the audience to recognize what the film is trying to be and he sticks his landing well with these scenes of eerie dialogue. When Gillian arrives at the island and is forced to investigate mysteries in the woods at night, Cravit nails the creepiness. As the camera slowly moves around a freaked out Clark, we can’t help but get sweaty palms as we feel ourselves growing more anxious. What’s better is that there aren’t too many of these moments, making these quiet pressure cookers enunciate strongly when they happen. Cravit is also having a ball throwing red herrings at his audience, including possible antagonists that may have more to do with the island’s history than we realize. Solo reveals more, including what’s overlooking Gillian. The routes the film travels on is all a matter of subjectivity. I watched Solo with my wife, who enjoyed where Cravit took his scary movie. I, on the other hand, thought these decisions made the film less effectively stimulating and increasingly mundane. Without spoiling the main course, Cravit’s screenplay makes the right choice to make delirium the main evil in Solo. The problem is – for me, at least – he chooses the wrong type of crazy. Solo would’ve been better off as something more psychological than being so literal. Solo is typical enough to get by. Some gory effects towards the end are appreciated and certainly help matters tonal wise. But, part of the joy of watching these smaller scale horrors/thrillers is finding steady specialties that make movie goers gush to others about the film – resulting in consecutive views. I just didn’t get that with Solo.